King International Financial Holdings Ltd | System | Case Studies | FiC Co. Ltd.
King International Financial Holdings Limited is a member of Hao Tian Development Group, Ltd (HK Stock Code: 474) founded by a group of market practitioners in 2015. King International Financial Holdings Limited is a Hong Kong-based electronic broker using state of the art on-line trading platform to service their clients. 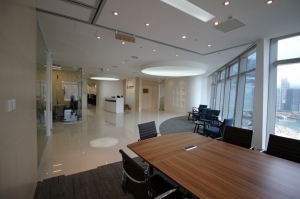 Their new office is located in one of the most signature A-grade business buildings in Kowloon; ICC (International Commerce Centre).